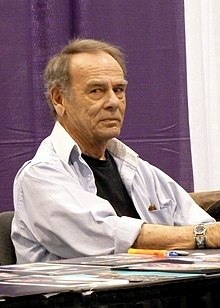 Robert Dean Stockwell (born March 5, 1936) is an American actor. His career has lasted for 70 years. As a child actor under contract to Metro-Goldwyn-Mayer, he first came to the public's attention in movies such as Anchors Aweigh (1945), The Green Years (1946), Gentleman's Agreement (1947), and Kim (1950). ↑ Zambrana, M. L. (2002). Nature Boy. Lincoln, NE: Writers Club Press. p. 2. ISBN 0595218296. "The Pro: A Conversation with Dean Stockwell". The Complete Quantum Leap: The Official Publication of the Show. MCA Publishing via Quantum Leap official site (Sci Fi Channel). Archived from the original on July 13, 2006. This page was last changed on 7 April 2019, at 02:05.